In recent years, there's been somewhat of an obsession with bacon—you've heard the saying, "everything is better with bacon." We see it wrapped around almost anything and even served as part of dessert. But, besides that it is part of the pig, do we really know what it is and where it comes from? Bacon is side pork, meaning it comes from the side of the pig. The meat is cured— soaked in a solution of salt, nitrates and sometimes sugar—and often smoked before you cook it at home. It is the fat in the bacon that provides most of the flavor and allows it to cook up crispy, yet tender. Do not turn up your nose at that fat—a hefty ratio of fat to meat is essential to good bacon, usually one-half to two-thirds fat to meat. Since bacon must be cooked before being consumed, much of the fat is rendered out and can be poured off if need be. Skillet: This is the classic method, and it's ideal for preparing 6-8 strips at a time. Remove the bacon from its packaging and allow it to come to room temperature (about 20 minutes). Don't preheat the pan, but rather place the strips (without overlapping) in the cold pan and cook them over medium heat, turning as needed, for about 10 minutes. Drain the cooked bacon on paper towels before serving. Oven: Cooking bacon in the oven makes sense when you're preparing a big batch, and you have a bit more time. Place bacon on a parchment-lined baking sheet and put it in a cold oven. Then heat the oven to 400 F and bake for 17-20 minutes or to desired crispness. There's no need to turn but you'll have to drain the cooked bacon on paper towels before serving. Microwave: You can microwave a few strips for a quick BLT or burger. Line the microwave with a couple of layers of paper towel, place the bacon strips down without overlapping, and cover with another layer of paper towel. Cook on high for 4-6 minutes, without turning. No draining required with this method. What Does Bacon Taste Like? The flavor of regular bacon can vary widely depending on the breed of the pig, its feed, how it is cut and the processing and curing methods. Let your taste buds be the judge and stick with what you like. In addition to basic no-frills bacon, you'll also find it available in a variety of flavors, including apple, maple, and mesquite. Low-fat and low-sodium versions are options for those on restricted diets. Bacon adds a delicious smoky touch to countless dishes, from the classic bacon and eggs breakfast to BLTs, burgers and more. Most bacon is purchased pre-sliced and sold as regular or thick slices. Thin bacon is cut into slices that are 1/32-inch thick, about 35 strips to the pound. Thin-sliced is also referred to as hotel or restaurant bacon. Regular slice is 1/16-inch thick and has 16 to 20 slices per pound. Thick-sliced bacon, generally twice as thick as regular bacon, contains 12 to 16 slices per pound on the average, depending on the supplier. You can also purchase bacon in a block (called slab bacon or ​flitch in Pennsylvania when unsmoked) and cut it into the thickness that best suits you. Outside the United States, one slice of bacon is often referred to as a rasher. Fully cooked bacon slices are also available in most markets for those with cooking time constraints. Canned bacon is a favorite with many as it is pre-cooked and shelf-stable until opened, but it is difficult to find these days. What's still around are bacon bits—pre-cooked pieces of bacon which are then dried. (Once opened, bacon bits must be refrigerated.) Do not confuse imitation bacon bits with the real thing! Imitation bacon bits are made of flavored vegetable protein. Packaged, raw sliced bacon can be kept in its unopened vacuum-sealed package in the refrigerator up to a week past the expiration date. Once opened, keep it tightly wrapped in foil or a zip-top bag and use within one week. Sealed packages of raw bacon can be frozen for up to one month. Plan in advance to thaw bacon in the refrigerator to reduce splatters during cooking. Cooked bacon is nice to have on hand for later use; cook the bacon to one level below how you like it done, drain on paper towels and cool. Seal it in a plastic bag and refrigerate up to five days. You can also freeze cooked bacon, in paper towel-wrapped individual portions in a zip top bag, for up to six weeks. A standard cooked slice of bacon contains about 30 to 40 calories and 3.3 grams of fat per slice. 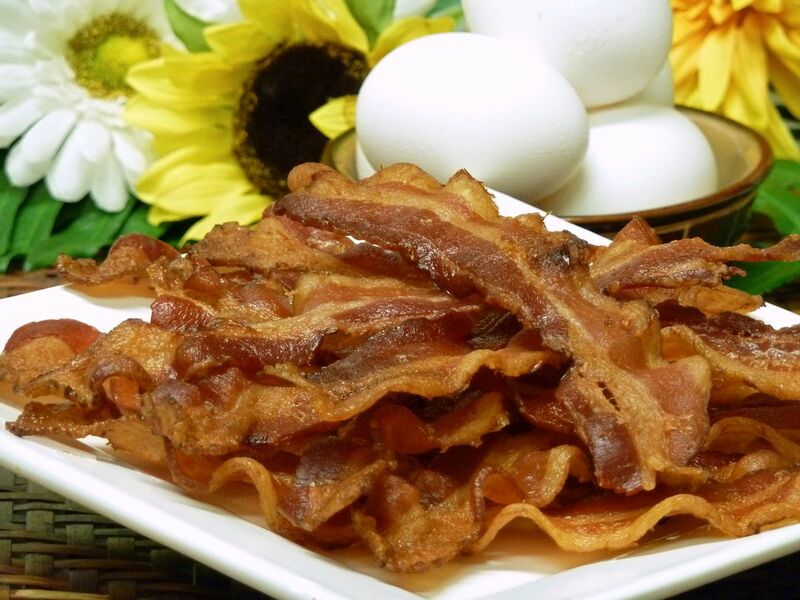 The fats in bacon are about 50% monounsaturated and a large part of those is oleic acid—the same fatty acid that makes olive oil "heart-healthy". When cooking bacon, do not cook at high temperatures for long periods of time. High heat can turn the nitrite curing agents into nitrosamine. Bacon cooked in the microwave contains fewer nitrosamines. (Read the synopsis.) Nitrates are used to not only preserve color but also as a preservative agent to retard rancidity in the fat and kill botulism bacteria. Nitrites have been the subject of controversy as a potentially cancer-causing agent in some animal experiments, but results are as yet inconclusive. There are nitrate-free bacon products on the market.